WE'VE GOT THE GIG FOR YOU! Help Us Move a Rolling Town! The Bicycle Ride Across Georgia is a 40 year tradition of cycling across the state. In 2019 BRAG is riding from Ellijay to Darien from June 1 – 8 with over 1,000 participants. 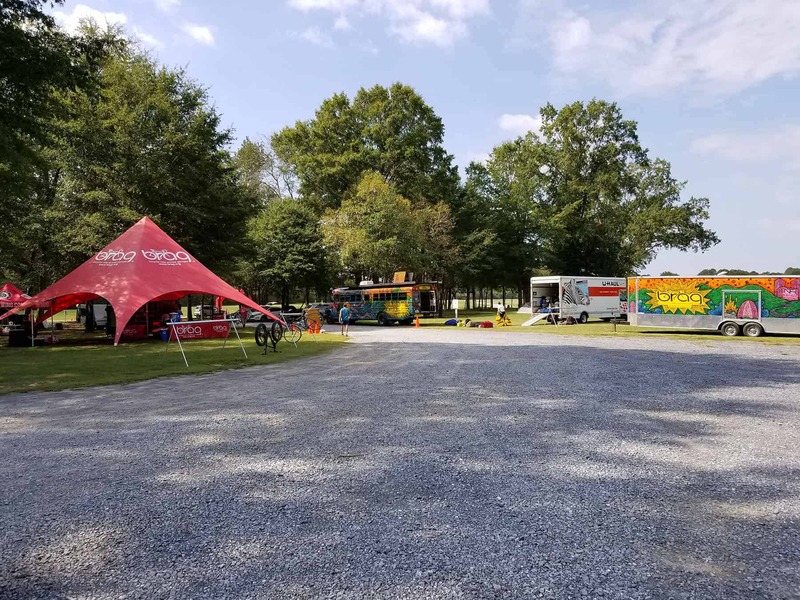 Ensuring these riders have ample space to camp, eat, use the restroom, have information to stay organized, find their way, and stay entertained is a big job. This presents a lot of moving parts and logistical challenges. It can be thought of as a rolling army, and camp must be broken down and setup each day in a new location. Driving a Box truck and or Bus from each overnight town. Placing signage for each location and ensuring each sign is collected at the end of the day. Setting up and breaking down tents, large fans with misters, and a charging station. Establishing a fun and friendly environment by providing support to riders. Trouble shooting logistical problems and simple mechanical issues with gear. Running errands such as deliveries, pickups from local stores, ice, etc. Additional duties will also be required on an ad hoc basis. Time management skills are necessary to ensure the coordinator allows plenty of time in the morning to break down camp and have everything loaded up and ready to move to the next location no later than 9:30am. Organizational skills to develop an efficient system for breaking down and setting up camp. Ensuring everything in the BRAG Trailer stays organized and clean over the course of the week. Physical strength and capacity to load up to 60lb bags and 200lb tents, heavy water filled coolers, and meet the physical requirements of the job. Interpersonal skills to interact with riders, ensure they are satisfied with the service and anticipate and meet their needs. Ability to camp either in a tent, hammock, on a bus, or on a cot in the back of a box truck. By 7:30 riders will have departed for the day. You may then break down all remaining essential items, bike pumps, signage, tents, etc. Load any remaining gear and drive the truck to the next town, typically a 30min – 1 hour drive. Arrive at the next town and begin to setup in the designated area. First setup the Headquarters area. Setup should be completed by 12:30. After setup check with BRAG director and HQ to see if there are any additional areas that need assistance. Depending on the day you may be pouring beer/wine from the BRAG Bar. Hours will typically be from 12 – 5. You also may need to go to a local big-box store to resupply with certain items such as ice, bottled water, snacks, etc. You may also complete this task on your drive from one town to the next. After all duties are completed, you are free to enjoy yourself for the rest of the day. Some towns have swimming pools or other activities, and there will be a concert each night in the downtown area. Drive a vehicle (yours with gas reimburse) for the Bicycle Ride Across Georgia in order to place signage for the riders and motorist. Place a directional arrow (H-Frame real estate type sign) at each turn to notify participants that they need to turn. Place warning signs on various sections of the route, warning cyclist of hazards and motorist of cyclist. Place cones and signage at the following days overnight town to ensure space will be available at the next days location. Pick up all the signs you place out. Label indoor rooms with the proper signage so participants know where they should be for certain activities. Manage sign inventory to ensure no signs are left behind. Driving skills to ensure safe operation of a motor vehicle and ability to pull off and onto the road in a safe manner to place signs. Time management skills are necessary to ensure the coordinator allows plenty of time to travel from one location to the next. Organizational skills to develop an efficient system for loading and unloading signs while keeping them organized. Physical strength and capacity to stake H-Frams signs and large signs securely in the ground. Ability to camp either in a tent, hammock at each nights overnight location, showers, and restrooms provided.